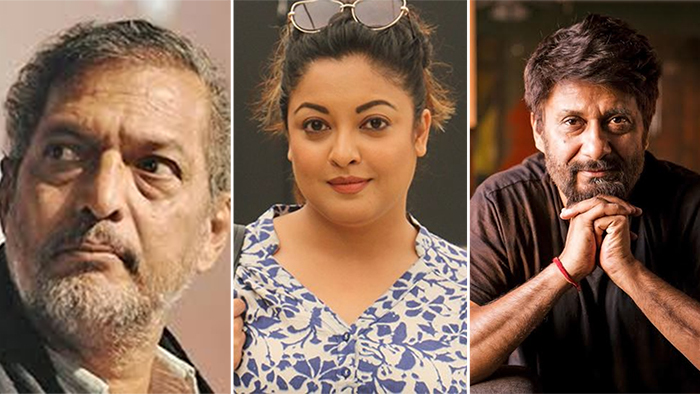 Tanushree Dutta, with her alleged revelations about veteran actor Nana Patekar all the way back from 2009, has managed to create quite the tumultous waves in Bollywood. Many celebrities, quite recently Freida Pinto, have chosen to stand in solidarity with the actress, while others have chosen to avoid commenting on the scandal. And then, of course, there’s Shakti Kapoor who tried to inject some unnecessary dose of humour in the situation. Media had quoted Nana Patekar saying that he was planning to initiate legal action against Tanushree. However, the actress had denied receiving any legal notices. However, Tanushree has finally revealed that she has been slapped with not one but two legal notices—from Nana Patekar and her Chocolate: Deep Dark Secrets director Vivek Agnihotri. ICYMI, Tanushree had alleged that Vivek made an indecent demand of her while shooting a song for the movie. Her co-stars Irrfan Khan and Suniel Shetty had then come to her rescue and defended her. Responding to the notices with an official statement, Tanushree called the notices ‘the price she had to pay for speaking out against the injustice that was meted to her’. Tanushree further alleged that two unknown men attempted to get into her home despite her police security. She also alleged involvement of MNS party in the threats she has been receiving and remarked at how such court cases in India get dragged on and on for years. Only yesterday, media was abuzz again when the the Cine and TV Artists’ Association (CINTAA) issued an official apology to Tanushree Dutta, admitting that her sexual harassment allegations against Nana Paterkar a decade ago weren’t handled properly. It now remains to be seen how this case unfolds. Will justice finally be meted out? Innocent until proven guilty, of course. But what will happen if proven guilty? Will Tanushree Dutta’s voice bring forth Bollywood’s #MeToo or will it be lost in the fight for justice as she claims in her statement?